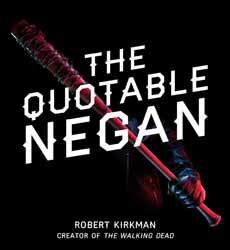 The Quotable Negan is a fun book to dip in and out of, but It's probably not an item you'd usually buy yourself. It's the sort of present that someone else, who doesn't really know what to get your for your birthday or Christmas, would pick up knowing you're a fan of The Walking Dead. It opens with an interesting Foreword by The Walking Dead creator Robert Kirkman. Normally you'd be forgiven for skipping this... but in this instance it's in your interest to read it, as Kirkman spills the beans on a few interesting Negan fact you may not be aware of - including the two times he almost killed the character. The quotes come detailed with which issue of the comic they are taken from. The book is split into segments which group quotes under different headings. So we have things like all the Lucille relevant quotes; intimidations and insults; some of the jokes he's told; and the softer side of the character (the quote from #162 where Negan buries his broken baseball bat is still one that gets to me). It also includes things like a Lucille Timeline, which points out the important moments in the baseball bats life span; how many kills Negan has racked up and in which issues; and how many times he's uttered some of his most famous expletives (Spoiler Alert! Most of them begin with "F"). It's a fun, novelty book that is great to flick through.